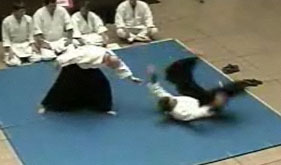 Here is some video footage of Aikido at Kansas State University practitioners. Video footage of a regular Aikido at Kansas State University class held in city park, june 2010. Regular Aikido at Kansas State University / Tatsumaki Aikikai class held in city park. June 2010. This is a piece that was broadcast on K-State TV about the Aikido at Kansas State University Demonstration at the Central Kansas Japanese Festival 2010. Aikido at Kansas State University in the 2003 K-State Royal Purple. Tsuki Kokyu-Nage: In this technique, uke (the attacker) is punching. Nage (who is being attacked) steps around the punch, then uses uke's own energy to make uke lose their balance and fall.